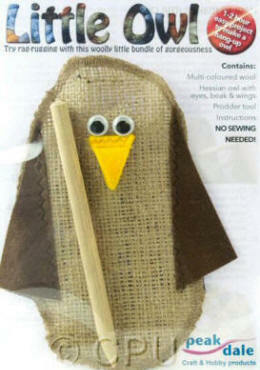 This kit makes one Little Owl from the owl backing and wool provided using the prodder tool. The technique used is similar to Rag Rugging and is a good introduction to that craft. The owl backing comes ready to use with its beak, safety eyes and wings attached. The edge is overlocked to prevent fraying. The yarn has 20-30% wool content and the colours may vary, however the yarn will always be multicoloured to give the feather effect. Includes pre-cut pre-made base, prodding tool, yarn & instructions. Click the picture to see a finished owl.